China cannot hold back on its investment on clean energy, even as its economy slows and its stock market slumps. NEW YORK (TheStreet) -- China might get tempted to put its environmental goals on hold in order to address its current problems with its economy and stock market. That would be a big mistake. China announced a bit of good news on the environmental front this week, saying emissions of two gases associated with acid rain, nitrogen oxide and sulfur dioxide, were reduced in the first half of the year compared to the same period in 2014. Such news is always welcome. The world's second-largest economy has committed to ambitious environmental goals, including cuts in its carbon emissions, and there is every sign China is serious about its role in fighting global climate change. Yet as the government of Premier Li Keqiang grapples with a raft of pressing economic problems both at home and abroad, it could well decide to put at least some of those environmental commitments on hold. Growth has slowed and stocks have plunged -- and the ensuing turmoil has taken a toll on markets worldwide. The central government has tried hard to control the chaos. And if ever it felt tempted to let some green goals slip, that time might well be now. But whatever the perils Beijing faces in the markets, they will only get worse if the country does not come to grips with its emissions crisis. For many of China's more than 1.3 billion people, choking pollution is a daily fact of life, and its contribution to global greenhouse gases is a pressing issue for China's global branding. Young and old alike fight their way through sickening smog just to get to school and work. Industry must continue to compete, but it must also reduce the energy intensity of everything it makes. Beyond the obvious social and environmental impacts, this also leaves the government facing potentially catastrophic long-term health care costs for the largest population on the planet. Sick people don't drive vibrant economies. Moreover, it is one thing to have a country where half its poor want to leave. It is quite another thing to have a country where half the wealthy want to leave. Having a healthy environment is critical to address this existential crisis. China is the largest consumer of coal in the world. When burned, coal creates emissions that add to local pollution as well as to the global greenhouse gas footprint. Nearly 70% of the electricity in China is still generated by burning coal, compared with 30% in the U.S. And while China's slowdown theoretically means factories are producing less pollution, it also means less demand for coal, which lowers its price and, in turn, makes it even more appealing as a raw material. To get out of this vicious cycle, Beijing needs to radically improve its power-to-pollution ratio. In other words, China must find a way to generate more power with fewer emissions. That means slashing its dependence on coal. Without question, the investment in renewable technologies needed to achieve that is expensive. And the cost now is even greater on a relative basis, with coal (and oil) prices at their lowest levels in years. So, even as China grapples with a slowdown, it also needs to persevere in the expensive investment of a conversion to clean technologies. Already, there are signs that China is coming up short on some of its commitments to renewable energy. The National Energy Administration, which oversees the country's energy development and industrial plans, said earlier this year that China had reached less than half of its planned solar energy capacity for 2015. Moreover, such official statistics don't always allow the transparency we would hope to see from the most important emerging economy in the world. At a time when China's GDP is growing at around 7.3%, for example, the China Electricity Council reported that electricity consumption grew just 1.3% in the first half of 2015. Clearly we might expect to see such a divergence between those numbers in a Western, consumer-based economy. But for all its stratospheric growth in recent years, China remains largely industrial -- and largely coal-burning. To many market analysts, those statistics sound more like a future target than present reality. But a review of China's past reveals a consistency in successful planning and execution. China sets a goal and it manages its industry to meet it. In fact, China's rapid growth has provided it with massive cash reserves, a deep pocket of riches that can, and will likely, be used to invest in the energy technologies of the future. History should lead a market observer to see the current situation -- at least with respect to energy and the environment -- as a bump in the road. The recent selloff could actually be a buying opportunity for energy investors. China's investment in renewable energy is a fixed asset investment that could act as stimulus to minimize the slowdown. China has laid out an aggressive but achievable goal to increase its renewable, low-emission energy sources to 20% by 2030 from 10% in 2013. It is truly a matter of self-preservation for the Chinese, and hardly less important for the rest of the world. Between 2000 and 2012, China's total CO2 emissions more than doubled, and its success in moving to renewable energy is essential in reaching global emissions goals. It used to be commonplace to say that, when America sneezed, the rest of the world caught a cold. 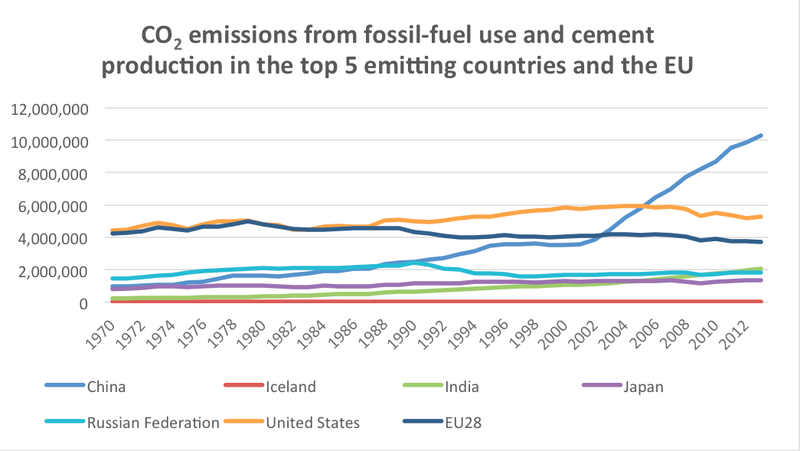 In many ways, and certainly when it comes to emissions, the same can be said of China today. China plays a central role in improving the environment for the entire planet. Let's hope the current slowdown doesn't tempt the government to change its mind.